The best plants for a strawberry pot require the same light conditions and moisture needs. To make the most of a strawberry pot's shape, choose plants that trail for the sides and upright ones for the top. Herbs, succulents and flowering annuals make plant shopping easier. 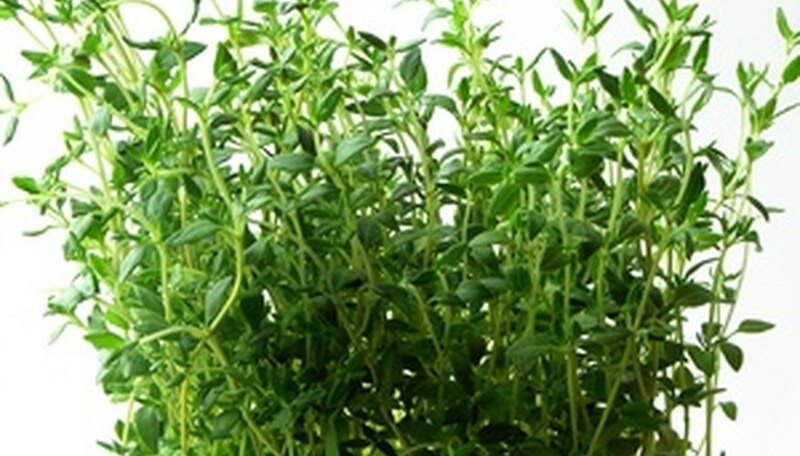 Thyme, creeping rosemary and lavender are herbs that prefer well-drained soil and bright sunlight. Their thick roots keep soil from escaping the holes in the sides of strawberry pots and, if given potting soil rich in organic matter, they can take a few days without watering. It's always a good idea to stick your finger a few inches into the holes of a strawberry pot every day for the first couple days until you get an idea how quickly it dries out. The plants will become more drought-tolerant as their roots grow deep in the container. Prune your herbs regularly, even if you don't cook with them. The new growth will keep plants looking healthy. Succulents are the best friend to the neglectful gardener. Strawberry pots full of succulents can be placed out in a landscape and forgotten without repercussion. They're drought-tolerant because they retain moisture in their leaves. 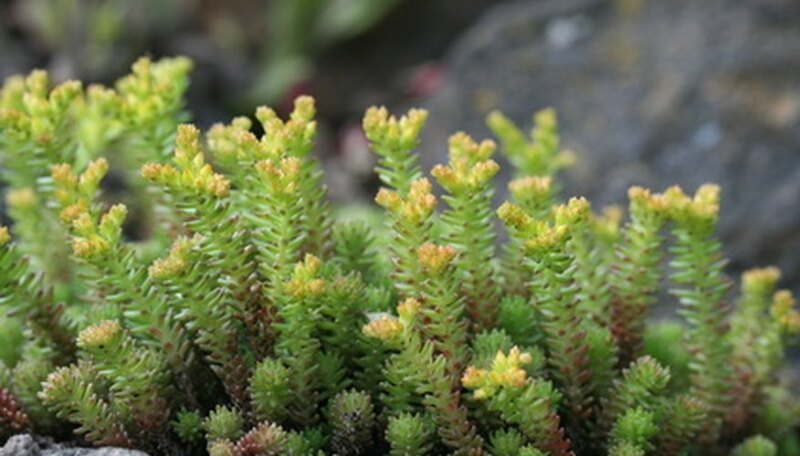 Golden Carpet sedum is a succulent that does superbly in strawberry pots faced with consistent, hot sun. Like many succulents, a small pot of it can be purchased and divided into three or four plants. It also grows quickly. Gardeners don't have to wait long for their strawberry pots to look well established. The Ice Plant is a South African succulent that has fringed hot-pink blooms on bluish needles. Its low-growth habit allows it to spill from a strawberry pot and pair well with the varied texture of other succulents. Once you have a few succulents with needle-like leaves, look for a contrasting form like that of hens and chicks. It forms rosette after rosette that can be clipped and nestled into open spaces. It also comes in foliage colors that include red, silver, bronze, blue and various shades of green. Although succulents often are hardy to zone 6, avoid winter's foliage damage by bringing strawberry pots indoors near a sunny window. Take caution not to over water them during this time, because there are no breezes to evaporate moisture. A strawberry pot full of flowers will stop people in their tracks. As always, select flowers first for their similar light and moisture requirements, with growth habit being a close third. 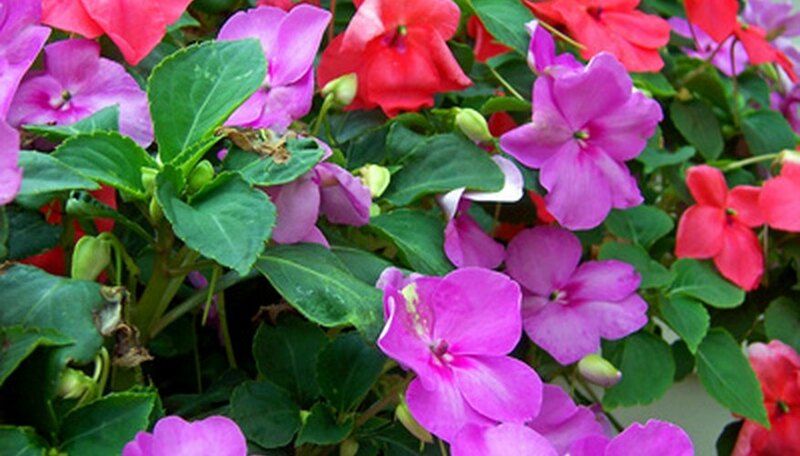 Impatiens love moisture and bloom furiously in the shade or partial sun. They are well-suited for strawberry pots because gardeners can feel confident about giving them a frequent, thorough soaking with the hose. As long as the pot has good drainage, the plants will be happy. Impatiens are also fast growers and will camouflage the pot very quickly if fertilized regularly. Creeping Jenny, also known as moneywort, has round lime-green leaves that also thrive in shaded, moist strawberry pots. Alternate it with flowers and the result will be a more sophisticated design. Creeping Jenny can take more sun, but the leaves will turn from lime-green to a more golden color. Wave petunias are a part of a new group of petunia hybrids that do not require dead-heading. These sun-loving annuals require weekly feeding with a high-phosphate, water-soluble fertilizer to look their best. When well fed, they spill from strawberry pots in a waterfall of color. They prefer damp, not soggy, soil. Water in the morning to prevent foliage from staying wet overnight. This would encourage fungus and bacterial disease. Diamond Frost Euphorbia has tiny white blooms and delicate foliage that complement most sun-loving or part-shade annuals. Keep soil consistently damp or its leaves will droop in a sad fashion. In the way that baby's breath complements a bouquet of roses, Diamond Frost offers an airy quality to strawberry pots. It's perfect for those who enjoy a cottage feel. Toppers, plants with upright growth habits, are perfect grown on top of strawberry pots. 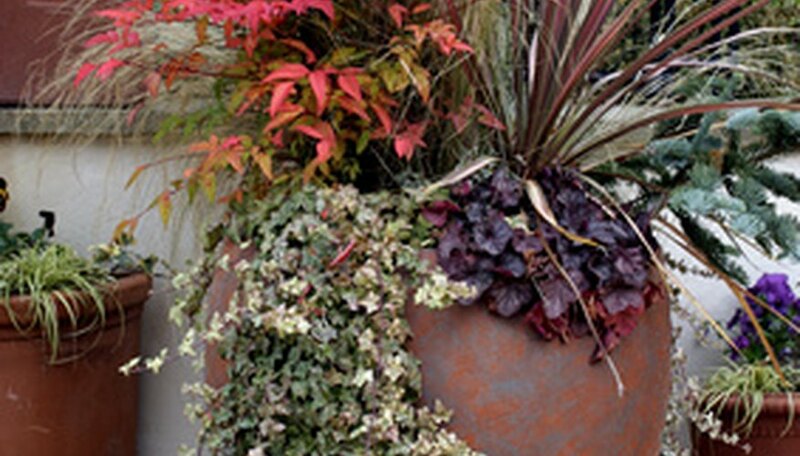 Of course it is not necessary to choose a tall plant for the top of a strawberry pot, but doing so will create drama and, in some cases, needed height. The Red Star Spike, a form of Cordyline, has strappy leaves in a rich burgundy color. It takes full sun to part shade and thrives in dry soil. It gives the traditional appearance of strawberry pots a more modern feel. Ornamental grasses offer strawberry pots a whimsical appearance. Bronco, a variety of Carex, has hair-like blades in a rusty color that makes it popular for autumn arrangements. Feel free to fluff it out to give your container more volume. Carex also comes in shades of green and numerous variegated varieties. Give it full to part sun and slightly moist soil. 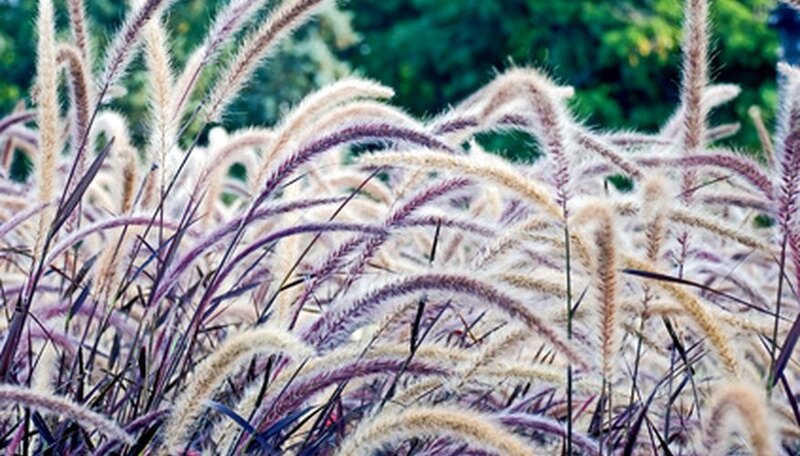 Purple Fountain Grass, Pennisetum setaceum, is an annual that takes full sun to part shade. The less sun it receives, however, the more it loses the deep purple of its leaves. It grows very quickly, so save money by purchasing it in small containers. Its mature three to four foot stature makes it suitable for only large strawberry pots. Planting it in smaller ones could make them top heavy and easily tipped over. There also would not be enough soil volume around the roots and the container would need constant watering.